But I am not deterred! I am lucky—partly it is geography—NYC is a mecca for designers, and is still a fashion center—There is talent everywhere, but a good percentage migrates here—and there are just so many NYer's, that well, even if only 1% (of 8 MILLION) are really talented, is still a lot of people. I am one of the most experienced knitters in each group—but I am the second rate designer in both! Last night at LICknits, was Hat night—Blogless Kim was wearing her pretty silvery jacket—and her version of the Mary Jane hat (knit with a glittery, silvery yarn). Gwen had her completed hat from some Louisa Harding book, and had cast on for another hat from the same collection/book. Me? I was hard at work (oh, yeah HARD!!) finishing up my Detour. I even finished it..It was a dud. A successful dud—everyone liked the idea—but the details just weren't right. 1—I opted for an easy (well easier) cast on. And this was mistake one. The best cast on is a bit difficult (but since it is the only difficult part, and is option—change 1 is the cast on. 2—the Ratios were wrong... the 11 inches were a perfect fit for pin headed (a 19 inch or so head) –but the 6.5 inches—Way to big! The 6.5 inches would have been fine for Kim (an other bowling ball head—22 inches!) if she could have dealt with the way, way too small 11 inches!-- the super stretchy cast on was stretched to the max, but it was just too small. The Cast On (a fine detail—but an important one) and the one I used doesn’t do the best job. The Ribbing –and it was too tight--or perhaps, more correctly, not enough of it. The Top—and it was too loose/large. 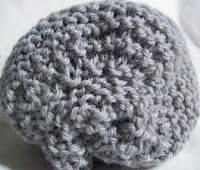 (Ok there are 2 more small elements, (1) I didn’t do, (a pompom!) and (2)I did do—and it was fine—this last element is about 2 inches of garter—a nice detail but a perfect detail doesn’t comp for major problems! And I cast on over 10% more stitches. That's it—So—here are the details. (Subtle—but OH, so important!) of the cast on. 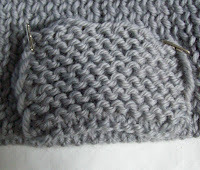 The second cast on starts the ribbing immediately. 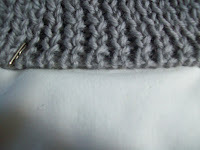 And I will edit the pattern—You might have to wait till the week end for the completed pattern. I was going to offer it for free--but my thinking about this has changed, too.. there will be a nominal charge--and 100% will be donated to Haita Relief/Rescue funds. The dud? Well it can be fixed. I will undo the cast on, frog back an inch or so, and do a bind off (grafted, natch). The changed ratios will work—the FO will be small—but workable. So dear readers—a detour and delay! But it will be worth the wait (The dud--with all its faults-- was well liked—so I know I am heading in the right direction... And I’ll get there! I salute your knitting stamina. Will patiently wait for the finished product. Good luck getting the design sorted out! I have utmost faith in you.